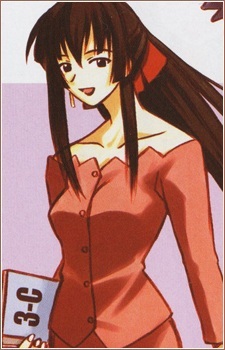 Love Hina: Motoko no Sentaku, Koi ka Ken... "Naku na"
Tsuruko is Motoko's older sister and the one currently entrusted with the keeping of their family's Shinmeiryuu tradition. She is not active in running the school, having given up the life of the sword for marriage, and it is her duty to hand the school over to Motoko's care when the time comes. Though Motoko has lived in fear of Tsuruko for years, Tsuruko has Motoko's best interests at heart and her only real wish is for her sister to be happy on whatever path she chooses to walk. Unfortunately, she has a habit of trying to kill her sister when she lies to her (when she tried to take Motoko back to Kyoto and, to prevent this, she pretended to be engaged with Keitaro) or does not tell her the full details of a situation (when Motoko omitted that she flunked the Todai admittance exam). Like her sister, her sword techniques are centered around the destruction of evil, using ki attacks with her slash, some of them hurting only evil beings, but mostly slashing through rocks, people or larger objects.